Nowadays, there are a lot of wonderful videos on YouTube that either keep you roaring with laughter or touch your heart deeply. But when you feel like to download videos from YouTube and make them more stylish with iMovie, some stumbling blocks may stop you from putting YouTube Video to iMovie. Why? Because YouTube files usually come with FLV format which is incompatible with iMovie, whereupon you need to download and convert YouTube file to a format that is friendly with iMovie first. Here is the detailed supported list of YouTube and iMovie. The different video format support lists never mean an endless failure of importing YouTube 4K/HD videos to iMovie. As long as you change the format of YouTube video to be the same as that of iMovie, things will become possible. Actually, this is a pretty straightforward matter so far as you own a YouTube converter such as MacX Video Converter Pro. This software is your ultimate solution to download and convert videos from YouTube to iMovie on Mac OS and PC, with all resolution, codec, and parameter settings tweaked in one click. Thereafter, you can edit the video downloaded from YouTube on your terrific iMovie. 3-5X faster conversion than competitors, thanks to the support of Multi-core CPU, hyper-threading and Level-3 hardware acceleration. Directly convert YouTube FLV, MP4, WebM and other SD/HD/4k videos to iMovie format and convert YouTube to MP4, MP3 or other formats with readymade profiles. Excellent YouTube downloader that can download videos from YouTube as well as other online sites like Facebook, Vimeo, Dailymotion, etc. Customize YouTube videos by trimming, clipping, watermarking and even adding subtitles to the videos. Free download YouTube to iMovie converter on Mac. You can also go to its windows version to get the YouTube FLV convertered downloaded on your Windows (10). Optional: Download YouTube Videos - If you haven't downloaded videos from YouTube on Mac and PC, this tool even allows you to capture videos from YouTube and make it compatible with iMovie. 1. Click "YouTube" button on the main interface. 2. Copy and paste the YouTube FLV video URL to the type box. 3. Choose the video resolution, codec, file size and format, the rest video downloading job will be automatically done by this app. Choose "to iMovie" button. Therefore, you may use this program to convert FLV video to iMovie. In addition to convert YouTube to MP3, MP4, MOV or M4V for iMovie, this program also helps to convert video to iPhone compatible format if you want to appreciate videos on your fashionable iPhone. 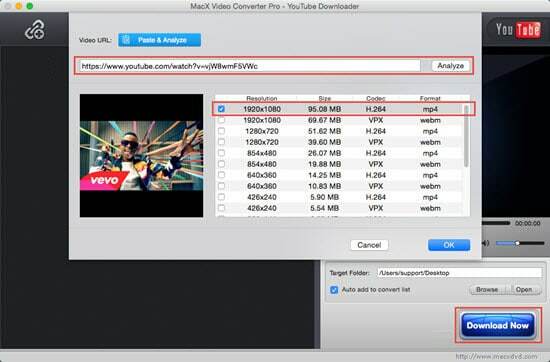 Then you can start conversion of YouTube FLV video to iMovie on Mac OS X. When the conversion is done you can edit the YouTube FLV or MP4 video on your iMovie. All the tasks can be finished at fast speed and high output quality. 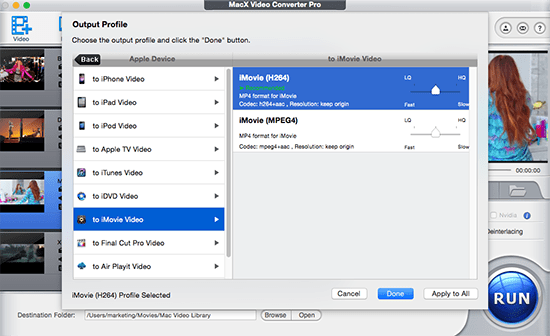 Note: Besides downloading and converting YouTube Video to iMovie, MacX Video Converter Pro also does support among a wealth of HD & SD video formats, including MKV, MTS, AVCHD, AVI,FLV, MPEG, MP4, WMV, MOV, and so on. Users can therefore easily enjoy your favorite videos on iPhone, iPad, iPod, etc. Besides there are also changes when users need to upload iMovie videos to YouTube again. But YouTube puts restrictions for video uploading, in terms of YouTube file size, video format, codec, etc. For a quick upload without needing to know the annoying conventions, MacX Video Converter Pro also aids you for iMovie to YouTube conversion. See more YouTube video upload limit. Step 1: Free download iMovie to YouTube converter on Mac. You can also go to its windows version to get the YouTube FLV convertered downloaded on your Windows (10). Step 2: After it loads the video information, a pop-up appears where you can go to youTube preset profiles to choose YouTube FLV as the output format. Note: Please make sure the converted YouTube video is within 15 min for a successful upload. Or else, you can rely on its video editor to cut off unwanted part and trim the video to get the favorite clip before conversion. Step 4: Press the "RUN" button to start the iMovie to YouTube video conversion. In this article you will get a step-by-step guide on how to download YouTube 4K/HD Video to iPhone on Mac, and watch your favorite videos on this tab with best video quality. iMovie won't let you import MP4 files? Easy solution is to convert MP4 to iMovie supported H264/MPEG-4 and AAC codecs. Thus, you can add MP4 into iMovie for editing. You find your iMovie keeps crashing when opening, adding, editing, exporting or sharing YouTube videos. Don't panic there are easy ways to fix iMovie keeps quitting unexpectedly issue. MacX Video Converter Pro is the best YouTube video converter, which can easily convert YouTube FLV videos to iMovie supported formats like MOV, MP4, M4V etc, along with excellent YouTube download feature.